The PX292 Series of differential pressure transmitters is designed to measure low pressures while using little power. A selection of ranges is available to meet most industrial and laboratory applications. The transmitters are housed in a rugged, gasketed, cast-aluminum case thatfs designed to NEMA 4 and IP65 standards. Wall-mounting holes are in the casting. The terminals are accessed through 1.2" conduit knockouts on the front of the box. There are no moving parts and the transmitters are virtually position insensitive. The span and zero settings are made via 20-turn potentiometers for easy, precise adjustments. The pressure sensing element is a differential capacitive cell for the low pressure ranges from 0.1 to 5 inH2O and a piezoresistive chip for ranges above 5 inH2O. Both sensors ensure reliability and long-term stability. Pressure Connection: 3.16" Dia. tube connections with integral filters at both ports. Suitable for 1.8" ID TygonR or polyurethane tubing (3-4 mm) or 1.4" OD polyethlene tubing (6 mm). If the measured differential pressure is expected to go from positive to negative, a transmitter with offset (elevated zero) should be ordered. The standard models in the order chart have no offset (i.e., at zero differential pressure, the output is 0 Vdc or 4 mA). 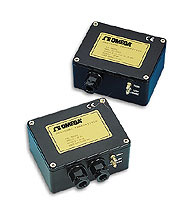 Two offset options are available: gAh 1.4 Span Offset At zero differential pressure, the output is 1.25 Vdc or 8 mA. Allowable Pressure Excursion: -33% to 100% of range gBh 1.2 Span Offset At zero differential pressure, the output is 2.5 Vdc or 12 mA. Allowable Pressure Excursion: -100% to 100% of range PX292-001WDI-B will have a range of +1" water at 20 mA and -1" water at 4 mA. Nota: See Specifications for description of the elevated zero option.